Philadelphia Phillies relief pitcher J.C. Romero has claimed victory in a lawsuit following an undisclosed cash settlement with the manufacturers and distributors of Ergopharm 6-OXO Extreme. Romero tested positive for the use of anabolic steroids under the Major League Baseball (MLB) Joint Drug Prevention and Treatment Program on August 26, 2008. The steroid positive came only six weeks prior to helping the Phillies win the World Series championship. Romero refused to accept responsibility for the positive steroid test and blamed androstenedione contamination from 6-OXO. “I purchased an over-the-counter supplement that I was told and believed would not cause me to test positive,” according to Romero in a statement released by his attorney David Cornwall. It turns out that it wasn’t Ergopharm that told him he wouldn’t test positive after taking 6-OXO. He relied on the advice of the minimum-wage workers at GNC and/or Vitamin Shoppe. In addition, the union that is supposed to protect its players from such mistakes had sent a letter to Romero telling him he wouldn’t test positive after taking a supplement purchased over-the-counter in the United States. It comes as no surprise that the MLBPA went on the attack against the supplement industry to deflect attention from their own role in misleading Romero. While Romero may consider the advice of GNC sales clerks and MLBPA advisory to constitute “reasonable precautions”, he would have done better if he simply read the label on a bottle of Ergopharm 6-OXO Extreme or took a cursory look at the MLB and/or the WADA prohibited substances list. 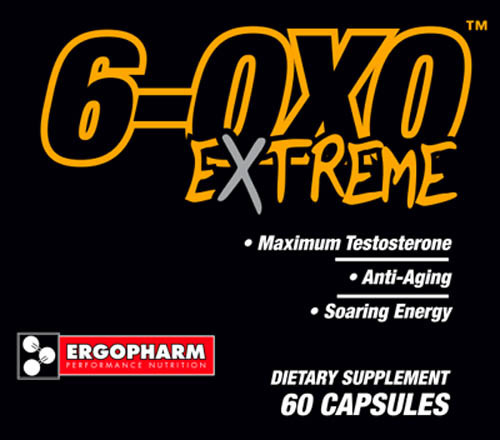 If he did, he would have known that (1) Ergopharm 6-OXO warned consumers that 6-OXO might be banned by some sports bodies; (2) the MLB prohibits the use of anti-aromatase inhibitors (such as 6-OXO) because “agents with antiestrogenic activity shall be considered Performance Enhancing Substances covered by the program” and (3) 6-OXO is banned by the World Anti-Doping Agency (WADA) prohibited substances list. The J.C. Romero ban could have been the result of a false positive from consuming the dietary supplement 6-OXO. Researchers have shown that 6-OXO can cause a false positive for androstenedione since the metabolites for 6-OXO and androstenedione are the same. Instead, Romero’s attorneys sought to blame infinitesimally small “trace contaminants” of androstenedione. Any such contamination would be unlikely to have any physiologic effect. The level of contaminants would be right at the limit of pharmaceutical disclosure of 0.1% or 100 micrograms per capsule. If 6-OXO was contaminated with a few micrograms of androstenedione, it is unlikely that a prohormone with an effective dosage of several hundred milligrams would have no physiologic impact at 1/1,000th the effective dosage of androstenedione. Patrick Arnold, who no longer owns Proviant or Ergopharm and was not a participant in the settlement, claims that Romero’s use of 6-OXO Extreme, in and of itself, constitutes a doping offense under MLB policy regardless of any contamination issues. Romero is guilty and no one else is to blame. “In essence, this is really not much different than taking growth hormone that is contaminated with testosterone – testing positive for testosterone – and then protesting your innocence by blaming the manufacturer of the growth hormone,” wrote Arnold on his blog.